Thanks alot, i was still missing the NavManager for b29! It is true that those addresses are writeable but it should be mentioned that those cant be used for 'true' teleport because the game still checks for obstackles or any other stuff blocking the way between point A and point B. If the result is '2' the current index from your loop through the playerarray is the playerindex. Unpack the Grim Dawn.exe with my Steamless project. 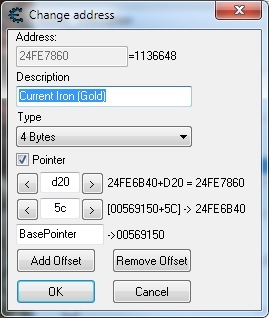 Open Grim Dawn.exe in IDA (or another disassembler of your choice). Follow the reference into the function it is referenced at. .text:00489551 holds the pointer, so adjust the pattern as needed per-update based on the minor changes. For whatever reason Grim Dawn devs decided to make this a convoluted process now instead of the easier lookup in the past. // Obtain the needed game objects..
// Obtain the player index..
// Obtain the object manager mask..
// Calculate the player object index..
v1.0.0.2 broke the AoB for the Object Manager and for the Nav Manager. Mind sharing your "personal memory class"? basePtrAoBArray = "8B 17 8B CF ?? ?? ?? 8B 3D ?? ?? ?? ?? 8B 4F"
-- Scans for specific BasePointers by using a specified 'Array of Bytes' on attaching a process to cheatengine. -- Change the format from any decimal value to a hex, uppercase address. 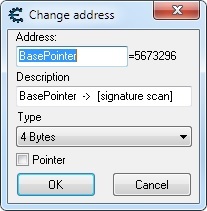 Now 'BasePointer' is a registered symbol and can easyli be used within your Grim Dawn Cheattable. You can also download a basic CE file (with the mentioned script above already integratred) here quickly.